A secret recording has revealed damming evidence showing that Belfast City Council officials advised East Belfast Football Club to place their community hub on site, despite now saying it was placed there illegally. A recording has emerged which shows Belfast City Council officials advising East Belfast Football Club that all that was required to temporarily place their community hub at the Inveraray site was the agreement of the Parks manager. A spokesperson for the club has said the tape, obtained by Unionist Voice, is ‘damming evidence’ and claimed that it highlighted the ‘duplicitous and underhanded’ nature of Belfast City Council’s targeting of the club. The secret recording reveals that a council official- whose name is being withheld- advised the club that they could place the structure on site if agreement was reached with the Parks manager. It is understood this happened prior to the structure being placed on site. This revelation will be hugely humiliating for Sinn Fein, the Alliance party and senior Belfast City Council officers who relentlessly parroted the lie that the club had brazenly placed the structure on site without permission. In fact the club were told they did not require full permission to place the hub on site, and were told this could happen on a temporary basis pending a full planning application. The recording undermines the entire basis of the argument put forward by Council officers, Sinn Fein and Alliance that the structure had been placed on the site ‘illegally’, in fact it had been placed there on the advice of council officials. The club were also at pains to point out that the whole process had led to damage to the hub and undermined plans to rennovate the structure- at no cost to the council. Yesterday senior Labour MP and former Government Minister under Tony Blair, Kate Hoey MP, tweeted that she was “horrified” at the actions of Belfast City Council. 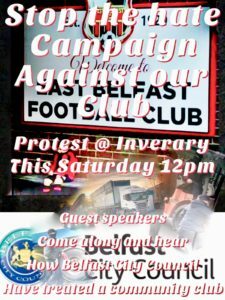 The club further revealed that they had organised a protest at 12pm on Saturday and extended an invite to the entire community and other clubs who felt they had been “discriminated against for sectatian reasons”. Note: If any mainstream media outlets are lifting stories from Unionist Voice we respectfully request that they have the courtesy to credit the site, as would be the case with all other outlets.